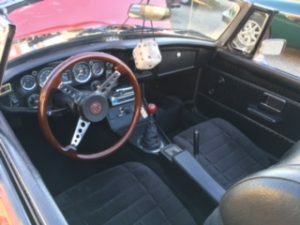 You are here: Home / Club News / ’74 MGB Back On the Road Again!! 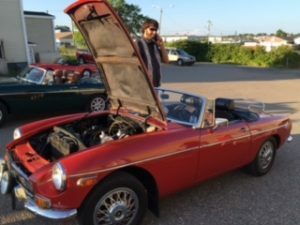 ’74 MGB Back On the Road Again!! Wilf’s B…On the Road Again!! 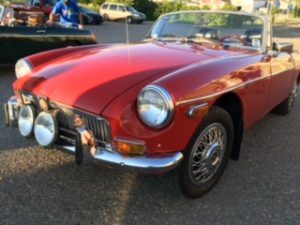 Hot August Nights 2018 saw the return of Wilf’s 1974 MGB. After 2 years of attempts to get the car up and running, the B was finally back on the road and looking its finest for the 2 day event. This spring, Wilf had the head replaced and the carbs redone. Just recently, he received a kit ordered from England with a new distributor, coil, wires, and plugs. After his grandson Colin put everything together, it was a magical moment when he fired it up and all systems were a “go”! It was plain to see that both Wilf & Sandra were as happy as clams as they participated in their 1st event with the car in 2 years. Here’s hoping we’ll see more of the B in future events with the BCCCB. Thanks Wilf for content details.